(with Hidden Weapon Wing Armor) The darkest and most evil villain to ever face the X-Men, Apocalypse possesses power beyond imagination. Awakening from hibernation, Apocalypse makes his attack again. . .
(with Transforming Wing Attack Armor) Fighting alongside the X-Men for as long as he has, Bishop has adventured throughout the world and battled unspeakable villains. But little can compare to flyin. 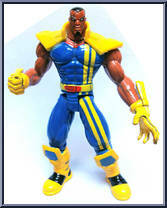 . .
(with Spring Loaded Wingpack) A member of the mutant group X-Factor, Shard now fights alongside the X-Men against the forces of Apocalypse. As skilled with a blaster as she is with her mutant powers. . .
(with Launching Bird of Prey Missile) With his super-strong Adamantium bones and claws, as well as a mutant healing factor, Wolverine can stand up to just about anything. So when the X-Men take on A. . .